When doing my research for our Disneyland trip 2 years ago, it was hard not to become completely sidetracked by the pictures and reviews of all the amazing foods Disney has to offer in their parks. There are blogs dedicated solely to sharing the world of Disney eats and one could easily spend a large portion of their time in the parks hunting down and enjoying a variety of sweet and savoury treats plus fine dining meals. Today I am sharing a simple DIY printable I designed to count down to our Disneyland trip next month. Creating a Mickey themed Christmas really hasn’t been that difficult given the amount of Mickey stuff already in our home. I loved Mickey when I was a kid and that certainly hasn’t changed as I’ve gotten older. For evidence, you need not look any further then my kids toy box or closets. With a boy and girl I think it is that much worse because I have reason to buy both the Mickey and Minnie versions of things! I have slowly been adding Mickey and Minnie themed Christmas items to our main floor over the past week and it finally took until Friday for my husband to comment “I guess we’re going with a Mickey theme for Christmas, eh?”. I love that he rarely questions my obsession and was even willing to go so far as to go give me my dream wedding in Walt Disney World. While in Disney World for our wedding and honeymoon, they had bride and groom themed mouse ears that I purchased. 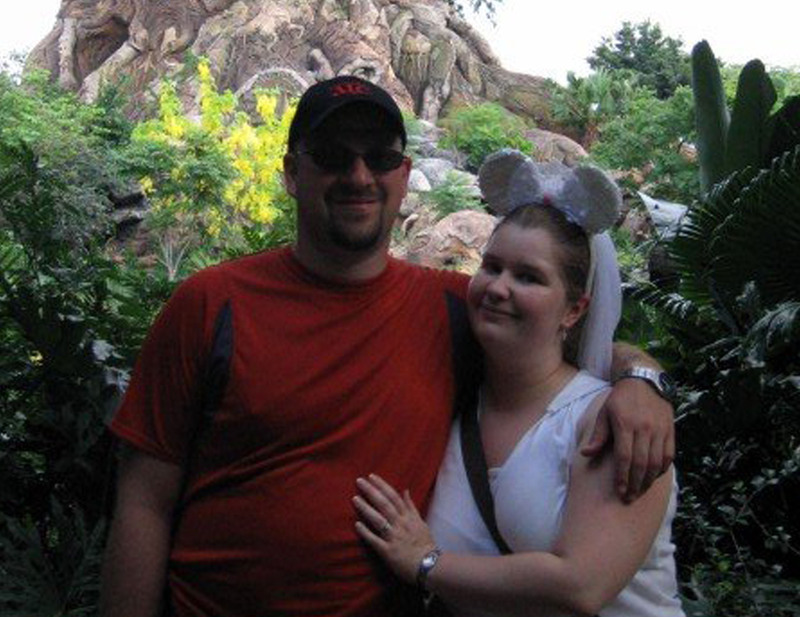 I wore my ears headband for most of our time in the parks, but the groom version was a bulky top hat and was too uncomfortable for my other half to really wear in the hot Florida heat. My bride ears got packed away in a box somewhere in the basement after our wedding, but the top hat has been sitting out on top of a shelf in our living room for the past several years. 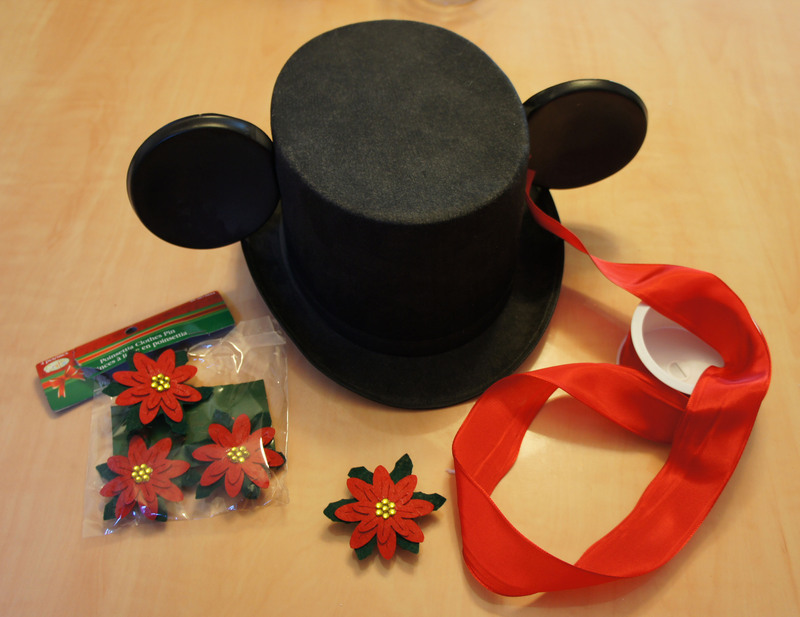 While searching on pinterest for different tree topper ideas, I came across an image of a Santa Mickey top hat and was instantly reminded that we still had the groom hat sitting around. After trying it on my little tree, I decided it would make the perfect tree topper. 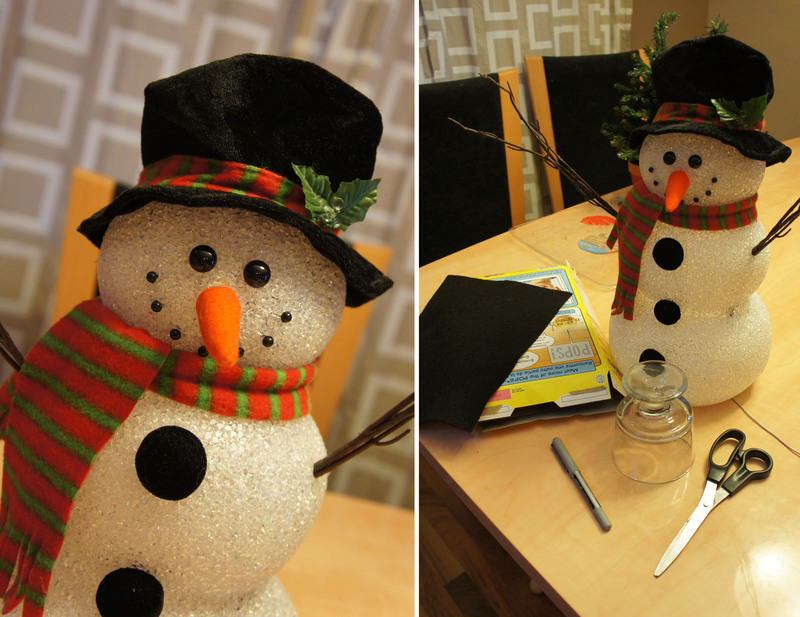 The hat looked good on the tree as it was, but I have a hard time not adding my own personal touch to things. To Doll it up and make it more festive, I simply added a strip of red ribbon and a poinsettia embellishment I found at the Dollar Store. It’s a little quirky and different, and I love the way it finishes off our tiny tree. Hooray for being able to repurpose things I already own!